Eric Knudsen wears black high top Converse “Chuck Taylor” All Stars in the film. Detective Matthews’ son Daniel is one of the people locked up in the booby-trapped house. Saw II is the sequel to the highly touted horror film of 2004. In it there is the return of the mastermind killer Jigsaw (Tobin Bell) who likes to create deadly games of survival, usually pitting people against some diabolical trap or situation. You see this in the opening scene where a lowlife guy named Michael (Noam Jenkins) wakes up to find he is trapped in a room with a death mask. If he can’t get the key to stop it from closing by a certain time, the mask will close and he will die. And the key has been implanted in his skull behind one of his eyes.... As the tagline says, Oh yes! There will be blood. The people trapped inside try to figure out what to do. The main story line to Saw II involves mostly new characters that include Detective Eric Matthews (Donnie Wahlberg) and his son Daniel (Eric Knudsen). Matthews and his wife are going through a bitter divorce, and he is somewhat estranged from Daniel, who has just been arrested for petty theft. When Detective Matthews is brought to the crime scene for the above described murder, there is a message left on the ceiling from Jigsaw. His supervisor wants him to get on the case, but he initially refuses. In the middle of the night, a sleepless Matthews suddenly realizes that something else must be happening, and a SWAT team is called out to the decrepit building where Jigsaw lives. The building is booby trapped and some of the team members are severely injured going in. Once inside they find Jigsaw, who it appears is dying of cancer and on an IV. The team wants to take him away, but he tells Matthews that he needs to be here while Matthews deals with the problem in the next room. On entry, the police frind an elaborate video security system which shows a group of people trapped in a basement including Matthews’ son Daniel. The house is filled with booby traps and Jigsaw tells them that a deadly nerve gas is being piped into the house which will ultimately kills everyone inside in two hours if they can’t figure out how to find the antidote. The antidote is locked in a safe and the people are told that they all possess the combination in the back of their heads if they can figure it out. The people trapped inside include Amanda (Shawnee Smith) a drug addict who returns from the first film, and ex-convicts Xavier (Franky G), Jonas (Glenn Plummer), Addison (Emmanuell Vaugier), Laura (Beverley Mitchell), Obi (Tim Burd) and Kerry (Dina Meyer). As the story continues, these people alternately are pitted against each other or foreced to work together as the ingenius plotting of Jigsaw continues to spring deadly traps or offer snippets of hope to the imprisoned people. As with all horror films, the impact of seeing for the first time would be spoiled if too much more plot information is revealed. 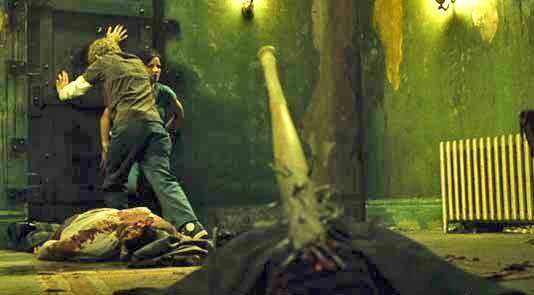 You can be that Saw II has the usual bloody twists and turns you would expect from this style. Daniel helps the lady who dived into the pit of syringes. Saw II continues the new style of horror plot first shown in the original Saw where the characters become responsible for their own demises by the clever planning and understanding of human nature devised by the master villain Jigsaw. The story line often plays on a karma theme -- that the bad actions of the characters in the past is justification for putting them through horrific and usually unsuccessful struggles to save their pathetic lives. The Saw series is particularly ingenious in the ways that it combines elements of technology with medieval-like torture devices in the execution of its plot twists. Probably the main fault of Saw II is that it tries to do too much in this area, making it somewhat unbelieveable in the end. More time could have been spent building up the suspense and allowing the characters trapped in the house to expose more of what makes them tick, and perhaps why they have become the victims of Jigsaw’s plot. Shawnee Smith in her role of Amanda provides you with some of this when she tells the others that she has played one of Jigsaw’s games before. The on screen antagonism between Donnie Wahlberg and Tobin Bell is also an interesting matchup, with Wahlberg as the shady and impulsive detective matching wits with the urbane, meek but diabolical killer. Eric Knudsen is effective as the defiant, then confused and terrified teenager who gradually regains some of his self-assurance during his ordeal. In the course of the film, he ends up being the main character that you identify and symphathize with. Even though it is in color, Saw II has some of the look of a film noir about it, with its darkly garish lighting, gloomy sets, and self-revealing passages of dialogue. Writer and director Darren Lynn Bouseman is the main force behind the Saw series and so credit (or blame) should primarily go to him. A third film is already in the works, so hopefully he will learn from the good and bad parts of Saw II, building on the inventive parts while avoiding the improbable. Nevertheless, if you liked the original Saw, and enjoy this genre, you will want to take a look at Saw II. Daniel and Amanda try to break the door down. Amanda and Daniel find themselves in a surreal morgue-like room. 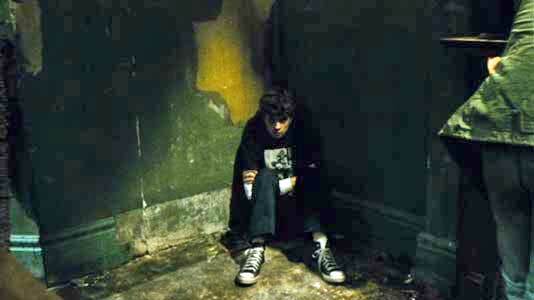 Eric Knudsen in his role as young Daniel wears black high top chucks in most of the scenes of Saw II. Even in the garish lighting throughout most of the film, they do stick out in the cinemaphotography as one little bit of normalcy in the grotesque scenery. Probably the best scene is when Amanda and Daniel finally escape out of the main house into a flourescent lighted tile room that was the setting for the original Saw film, complete with hacksaws and dead bodies. A shocked Daniel and Amanda rest against the wall. Saw II. ((2005) Donnie Wahlberg, Shawnee Smith, Tobin Bell, Frank G, Glenn Plummer, Dina Meyer, Emmanuelle Vaugnier, Beverley Mitchell, Erik Knudsen, Tim Burd, Lyriq Bent, Noam Jenkins. Written and directed by Darren Lynn Bousman. Categories: Horror, Crime and Mystery.